Do Planets Actually Tug on Passing Bodies? Our current belief in the remote gravitational tug from distant planets even gives rise to periodic predictions of unusual increases in tidal effects on Earth. These predictions arise from an expected increase in the “gravitational pull” upon the Earth when a number of planets are due to align with the Earth in their orbits about the Sun; yet, the predicted effects never seem to materialize. The reason nothing happens, of course, is because there is no gravitational force emanating from these planets to affect the Earth, and it is unlikely that the Earth has additional internal wobbles that would cause changes in our tidal forces to coincide with such arbitrary planetary alignments. Yet, there are still other observations that are commonly attributed to “gravitational tidal forces.” What are we to make of these claims now that numerous flaws have been pointed out in today’s gravitational theory, and such remote forces reaching across space do not even exist in Expansion Theory? Let’s now take a closer look at a widely reported example of such an apparent tidal-force effect in our solar system. One of the most well known and widely reported examples of apparent tidal forces involves the comet Shoemaker-Levy 9, which plummeted into Jupiter in 1994. The comet was actually composed of a number of separate pieces as it headed toward Jupiter, making a number of spectacular impacts when it struck the planet. It is commonly believed that the gravitational field of Jupiter pulled the comet Shoemaker-Levy 9 apart as it swung by on an earlier close approach; however, there is a clear flaw in this belief. To see this, consider the space shuttle, which circles the Earth roughly every 90 minutes. If the shuttle were truly constrained in orbit by a gravitational force, like a rock swung on a string, it might seem that there should be sizable stresses across the shuttle as it is so rapidly flung around the planet and continually forced into a circular orbit. Certainly an object swung rapidly on a string would experience such stresses, yet there is no sign of such a powerful force pulling on the shuttle. This is currently explained by the belief that gravity would permeate the shuttle, pulling on every atom so that the near and far sides of the shuttle would both experience nearly the same pull, with only a slightly weaker pull on the side farther from the planet. Therefore, unlike a rock that undergoes great stress as it is pulled by an externally attached string, all of the atoms composing the shuttle are presumably immersed in the attracting gravitational field, resulting in only a slight differential strain across the shuttle. If this explanation were true, then this small differential strain across the shuttle would be very tiny indeed. No signs of such a strain on the shuttle and its contents have ever been measured or noted – even after presumably acting for a week or more during a typical shuttle mission. Even free-floating objects show no sign of being even slightly disturbed by any such internal stresses pulling across the shuttle due to this slight differential pull of gravity. Therefore, it would be quite reasonable, if not generous, to say that if such a tiny differential force was actually pulling across the shuttle, it would be no greater than perhaps the force felt by the weight of a feather on Earth. Although the lack of evidence of any such force can be seen as a clear sign that the shuttle is actually on a natural force-free orbital trajectory as explained by Expansion Theory, let’s see what happens when we apply this gravitational analysis to the scenario of comet Shoemaker-Levy 9. When the comet was first discovered in 1993 it was already fragmented. Attempts were made to determine how the comet broke apart by re-examining past observations. Although the evidence is sketchy, it is still commonly reported that the comet was pulled apart by Jupiter’s gravity during an earlier approach at a distance of roughly 1.3 planetary radii from Jupiter’s center. That is, the distance of the comet above the surface of Jupiter as it flew past was roughly equivalent to one-third of the planet’s radius. A standard calculation of the reduction in gravitational strength with distance – according to Newton’s theory – shows that, at that distance, the comet would have experienced a gravitational pull that was 40% weaker than at Jupiter’s surface. To put this in perspective, this represents a force on the comet that is only 50% stronger than the gravitational force that is theoretically constraining the space shuttle as it orbits the Earth (remember, no such force has ever actually been felt or measured). Now, since we know that the net stresses across the shuttle in near-Earth orbit are imperceptible even when supposedly acting continually for days, it is difficult to justify that a stress only 50% greater across the comet Shoemaker-Levy 9 during a brief flyby would have torn it apart. The situation does not change even if we consider there would have been a greater gravitational difference across the 2-km comet than if it were the size of the much smaller space shuttle. Each shuttle-sized segment of the comet’s diameter would still have experienced a pulling force across it of no more than the weight of a feather, as mentioned earlier. Even with a hundred such segments across the comet this total force of no more than the weight of a handful of feathers across a 2-km comet is many thousands, if not millions of times too weak to tear it apart. So, we are left with the mystery that Newton’s gravitational force, even if it did exist, could not possibly have been responsible for the breakup of the comet Shoemaker-Levy 9. This widely held belief demonstrates the powerful confirmation bias fallacy that exists in our science, presenting such clearly false evidence as solid support for today’s gravitational theories. In stark contrast, there are no forces at all upon the comet according to Expansion Theory. However, this is not a complete mystery, as there are numerous additional explanations. Jupiter is known to have an immense magnetic field, which could have played a role in the comet’s breakup. Alternatively, the comet could have collided with other space debris orbiting about Jupiter. Also, the comet would have undergone sizable alternate heating and cooling as it approached then receded from the Sun during its travels, perhaps experiencing sizable blasts of plasma from sunspot activity as well. The comet could even have had a pre-existing fragmentation that was impossible to clearly resolve in earlier photos containing it as a faint blur by chance prior to its official discovery. Regardless, in the list of possible causes, it is clear that being torn apart by a “gravitational tidal force” could not be among them. These discussions of tidal effects show that there is no clear evidence for the existence of “gravitational tidal forces” acting at a distance between orbiting bodies. In particular, the example of comet Shoemaker-Levy 9 shows how easily such verifiably false explanations of observations can nevertheless become widely accepted in our science, eventually becoming unquestioned fact. Many of the ideas we have inherited as a scientific legacy from centuries past have become so firmly ingrained in our thinking and belief system that they are often unquestioned in situations where they clearly cannot possibly apply. Due to this process it is now readily accepted that an endless gravitational force reaches out into space, tearing comets apart and inducing ocean tides and volcanic activity on orbiting moons and planets. However, Expansion Theory allows us to take a second look at our inherited beliefs, and in the process, to see the clear physical causes at work that have been masked by such largely unquestioned beliefs as Newton’s gravitational force or Einstein’s warped space-time abstraction. One of the most compelling phenomena used in our space programs is that of the so-called “gravity-assist” maneuver, also often called the Slingshot Effect. This is a maneuver where a spacecraft catches up to an orbiting planet from behind, swings by the planet in a partial orbit, and then is flung away on a new trajectory at a faster speed. This is currently believed to be the result of the planet’s gravity accelerating the spacecraft toward it, towing the spacecraft along briefly while swinging it around, then releasing it off into space again at an increased overall speed. This is a very real effect that many space missions rely upon to give fuel-free speed boosts to spacecraft that are sent across the solar system. Let’s now take a closer look at this effect. As with falling and orbiting objects, there is no question that the observed effect of the “gravity-assist” maneuver does occur; the question, though, is whether the current explanation in our science is at least logically sound – and further, whether it is scientifically viable and consistent with other celestial observations. The discussions so far have repeatedly shown that the concept of a gravitational force at work behind many of our observations violates the laws of physics, while presenting alternate, scientifically viable explanations for these observations according to Expansion Theory. This means that a “gravitational force” explanation for “gravity-assist” maneuvers, if actually true, would now stand alone as quite a mystery, based on a proposed gravitational force that has been otherwise shown to be scientifically unexplained if not even verifiably false. Therefore, even prior to deeper investigation, it can already be said that the current gravitational explanation for this effect is not scientifically viable, nor would it even be consistent with other observations such as falling objects, orbits and tidal forces – for which the gravitational-force explanation is highly questionable. The only remaining question is whether today’s explanation for “gravity-assists” is at least feasible in principle, regardless of the additional problems that arise with the “gravitational force” explanation. The analysis to follow shows that even the logic within the current explanation in our science does not stand up to scrutiny. The basic idea of being pulled-in then flung off into space at a faster speed by gravity is a fundamentally flawed concept, since Newton’s gravitational force is considered to be a purely attracting force. In order for the spacecraft to be flung off into space at an increased speed, the planet’s gravity would have to “let go” of the spacecraft somehow, after pulling it in. Otherwise, the situation would be somewhat as if an elastic band were stretched between the planet and the spacecraft. The elastic band would pull the spacecraft in, accelerating it toward the planet, but then would decelerate the spacecraft again as it attempted to speed away. In somewhat similar fashion, the same gravitational force that supposedly accelerates a spacecraft throughout its approach to a planet would also continually decelerate it as it traveled away, returning the spacecraft to its original approach speed as it leaves. Yet, since spacecraft are clearly observed to depart with greater speed than on approach when this maneuver is performed in practice, logical justifications have been arrived at in an attempt to explain this effect from the only practical viewpoint available today – Newton’s gravitational theory. The typical explanation in today’s science often does acknowledge the “gravitational elastic band” problem just mentioned, but claims that there is an additional effect in practice when moving planets are involved – an effect where the spacecraft is said to “steal momentum” from the orbiting planet. This concept begins with the idea that as a spacecraft catches up to and is pulled toward a planet that is orbiting the Sun, the spacecraft would also pull the planet backward slightly. This would slow the planet in its orbit while the spacecraft gets a large speed boost forward due to its far smaller mass, essentially transferring momentum from the orbiting planet to the passing spaceship. Then, although it is acknowledged that the planet’s gravity would pull back on the spacecraft as it leaves, slowing it back to the same relative speed it had with the planet before the maneuver, the spacecraft still leaves with a net increase in speed. This is said to occur because the planet is now traveling slightly slower in its orbit about the Sun after being pulled backward, with this lost momentum now transferred to the spacecraft, speeding up the much lighter spacecraft by far more than the massive planet was slowed. Essentially, this explanation says that the spacecraft reaches ahead via gravity and pulls on the planet to speed ahead while slightly slowing the planet in exchange, thus permanently stealing momentum from the massive planet to give the tiny spacecraft a sizable lasting speed boost. Although this explanation may seem feasible on first read, a closer examination shows that it suffers from the same fatal flaw mentioned earlier, where the gravity of a stationary planet would pull back on the departing spacecraft, canceling any speed increase that may have occurred on approach. The “momentum stealing” explanation simply creates the illusion that the situation is different when the planet is moving in its orbit. Let’s now take a good look at this illusion. First, taking the simpler scenario of a stationary planet approached by the spaceship, clearly a “gravitational elastic band” accelerating the spacecraft toward the planet would also equally decelerate it as it leaves, giving no net speed increase. This is what Newtonian gravitational theory would predict. The more complex scenario is that of a moving planet approached from behind by the spacecraft. Here, however, it is claimed there is something fundamentally different simply because the planet is moving. It is claimed that the planet is pulled backward and permanently slowed in its orbit, giving a lasting “momentum transfer” and speed boost to the spacecraft that pulled itself ahead. This is where the illusion is created from flawed logic. In actuality, there could be nothing fundamentally different with a moving planet – there would still be no net speed changes. To see this, we simply need to imagine ourselves coasting along with the moving planet, in which case the planet is no longer moving relative to us, and it is easier to see that the situation is essentially the same as with the stationary planet. Recall that it is now widely recognized that all motion is purely relative – there is no absolute reference anywhere – so there can be no fundamental difference between a stationary planet and one that is merely stationary relative to us. This logical flaw in the current explanation is often overlooked because the additional issue of the planet being pulled backward in its orbit is typically only mentioned for the moving planet, making it appear as if a moving planet presents a fundamentally different situation than a stationary one. 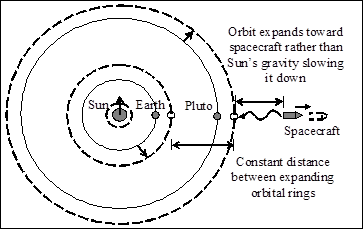 But in actuality, a stationary planet would be pulled backward in the same manner by the “gravitational elastic band” as the spacecraft approached (Fig. 3-23); it is simply easier to overlook this fact with the stationary planet since the focus is on the motion of the spacecraft. 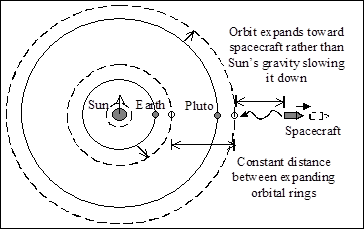 As today’s gravitational force-based explanation in Figure 3-23 shows, the spacecraft would be accelerated forward by the gravity of the stationary planet, but would also pull the planet backward slightly in the process – just as commonly stated for the moving planet. Then, the situation would completely reverse itself after the spacecraft passed the planet. The planet would be pulled forward to its original position as it pulls on the departing spacecraft, slowing the spacecraft to its original approach speed as well. And, once again, there is no reason to expect this final situation to be any different with a moving planet – both the planet and the spacecraft would have no lasting speed change according to Newtonian gravitational theory. A simple way to visualize this is to picture the whole diagram in Figure 3-23 moving to the left across the page. This would be entirely equivalent to the planet moving in its orbit, with the spacecraft initially catching up to the planet from behind. It is clear to see that nothing fundamentally changes simply because the overall diagram moves across the page. Both the planet and the spacecraft still end up with no net speed changes. Likewise, nothing fundamentally changes in the “momentum stealing” explanation of “gravity-assist” maneuvers simply because the planet moves along in its orbit. Whether the planet is moving or not, there would be no lasting slowing of the planet according to Newtonian gravitational theory, and no net speed increase imparted to the spacecraft – in short, no “momentum stealing” by the spacecraft. The belief that we understand the physics of this maneuver is a myth perpetuated by this flawed “momentum stealing” logic, which has simply been repeated, uncorrected for decades. This has occurred because we have come to believe unquestioningly in Newton’s gravitational force, and at this age of advanced science and technology it is almost inconceivable that a maneuver at the core of our space programs could be a completely unexplained – and unexplainable – mystery. Instead, we have simply learned to exploit a mysterious effect that obviously does occur, while attempting to invent logical justifications for it rather than allowing this mystery to stand in plain view, pointing to a deeper physical truth awaiting discovery. The “Gravity-Assist” or Slingshot Effect is a Purely Geometric Effect. 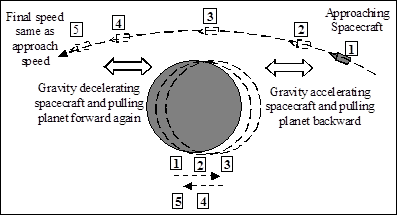 Since it has just been shown that the “gravity-assist” maneuver cannot be explained using today’s gravitational theory, the following explanation from the perspective of Expansion Theory will refer to this maneuver by another commonly used term – the Slingshot Effect – to make a clear distinction between the two explanations. This is also a more appropriate term to use in a discussion that shows this maneuver to actually be a purely geometric effect that does not involve any type of gravitational force upon the spacecraft as its speed effectively increases. First, we must consider what a trip through the solar system means from the perspective of Expansion Theory. Just as every atom, object, and planet must all expand at the same universal atomic expansion rate to remain the same relative size, so must the orbits of the planets around the Sun. This is not to say that empty space itself expands, as if it were a material object composed of expanding atoms, but that the speed and trajectory of orbiting objects continually moves them away from the expanding body they are orbiting, resulting in their orbit essentially expanding in step. Our Moon, for example, coasts past our spherical planet, whose shape rapidly curves away as the Moon travels past, but is immediately counteracted by the planet’s expansion toward the Moon, maintaining a constant distance between them and a stable lunar orbit. The Moon continues coasting past and away and the Earth continues expanding in balance, so the overall stable Earth-Moon orbital system continually expands in step. The same is true of all planetary orbits about the Sun as well. If this weren’t the case, the planets and their orbits would not maintain their relative sizes, and their orbital distances from the Sun would effectively either continually increase or decrease, depending on whether the planets or their orbits were expanding at the greater rate. Therefore, the solar system could be thought of as a very large expanding “object” composed of equally expanding planetary rings centered on the Sun, each maintaining a constant relative distance from each other as they expand. And so traveling across the solar system actually involves the geometry of rising in orbit about the expanding orbital rings of the planets. Let’s see how this occurs. The fundamentals of this principle can be seen even in the scenario of a spacecraft launched into orbit about the Earth. This is done by first rocketing vertically away from the ground, then slowly arcing toward a horizontal trajectory as the spacecraft is inserted into a coasting orbit around the planet. If the speed of the spacecraft exceeds the orbital speed for that particular altitude when it turns to fly horizontally into an orbit, it will continue to coast upward in a rising orbit, eventually settling into a stable orbit further out. And, if the spacecraft is traveling fast enough, it will actually rise into a trajectory that escapes the planet entirely. In this case, it does not simply coast straight off into deep space, but moves into a rising orbit about Earth’s enormous expanding orbital ring around the Sun (Fig. 3-24). Although it would take tremendous speed to overcome the expansion of such an enormous “object” as the Earth’s orbital ring around the Sun, the spacecraft, of course, was already traveling fast enough to equal this enormous expansion even before launch. The Earth essentially “skims the surface” of its huge expanding orbital ring as it orbits the Sun, speeding past at a rate that matches the outward expansion of this ring. Therefore, every object on the planet already has the required speed to equal the expansion of Earth’s orbital ring, and at the equator of our spinning planet objects even exceed this speed, which is why launches generally occur at the equator. So the spaceship merely needs to fly fast enough relative to our planet to escape the Earth’s expansion, at which point it far exceeds the expansion of the Earth’s larger orbital ring, and now effectively continues away from the Sun as it actually rises in orbit about this large orbital ring. This is similar to one of the most common orbital maneuvers in our space programs today, known as the Hohmann Transfer Orbit, except that today’s terminology assumes our spacecraft travel across the solar system by literally rising in orbit about the Sun based on a mass-based gravitational force. Expansion Theory, on the other hand, shows this to actually be a rising orbit about the nearest inner orbital ring for purely geometric reasons instead. 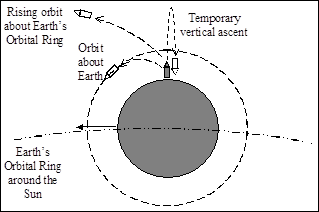 The spacecraft’s turn toward a speeding horizontal trajectory in Figure 3-24 altered its fate from slowing in its vertical climb and falling back to Earth (actually the Earth’s expansion catching up to it), to one where it continues to coast in a rising orbit. From the perspective of Expansion Theory, this very same principle is involved in traveling across the solar system, with the spacecraft continuing in rising orbits about the orbital rings of successive planets. Getting to Jupiter, for example, would first involve rocketing away from the expanding Earth, turning to rise rapidly in orbit about the planet, and soon escaping the planet’s expansion and moving on to a rising orbit about the Earth’s enormous orbital ring. Then, as the spacecraft coasted toward Mars, it would effectively lose speed as the Earth’s orbital ring continued its accelerating outward expansion toward the spacecraft. 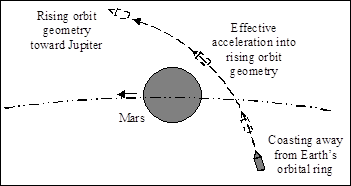 However, just like the spacecraft that turns horizontally and enters a rising orbit about the Earth to avoid falling back to the ground, our interplanetary spacecraft encounters Mars, taking a similar turn as it effectively accelerates in a partial orbit around Mars, as shown earlier in Figure 3-23. But unlike Figure 3-23, the interplanetary spaceship does not have a decelerating trajectory relative to Mars as it departs; instead, before this can occur, the spaceship is effectively accelerated and launched into a rising orbit about Mars’ orbital ring, as in Figure 3-24. This occurs because the partial orbit about Mars defines a geometry where the spaceship is effectively accelerated as it heads toward the expanding planet and swings around it, though no forces are involved in this effective acceleration. This is not unlike the effective acceleration of a dropped object due to the planet actually expanding toward the object. However, this effective increase in speed causes the spacecraft to exceed Mars’ expansion and escape into a definition as an object in a rising orbit about Mars’ orbital ring, much like the initial escape from Earth (again, Figure 3-24). Remember that neither Newton’s First Law of Motion nor Newton’s “gravitational force” actually exists. Celestial dynamics are entirely defined by the relative geometry of expanding objects. If this geometry defines an effective acceleration toward Mars, which immediately becomes a rapid escape from Mars into a rising orbit about its orbital ring, then this is what occurs. This is the natural way events proceed in the solar system, and there is no reason this should not be the case. It is only our Newtonian thinking – with absolute momentum possessed by objects and unexplained gravitational forces – that turns this situation into an unexplainable “gravity-assist” maneuver. Instead, Expansion Theory shows that it is simply a natural geometric slingshot effect, just as there is a Natural Orbit Effect as explained earlier. There is no “gravitational elastic band” and no “momentum stealing” that we must attempt to justify. The spacecraft simply continues on from this effective acceleration and launch into a new rising orbit, coasting onward toward Jupiter (Fig. 3-25). As further evidence of this, the Voyager 2 spacecraft reported no forces, stresses or strains due to the “gravity-assists” it received as it traveled through the solar system, even when such maneuvers accelerated it to over twice its original speed. Although such stress-free acceleration is impossible in classical physics, it is a natural and expected result in Expansion Theory, since this is actually an effective acceleration due to the purely geometric Slingshot Effect involving no forceful acceleration upon the spacecraft. Once again, Newton’s First Law of Motion is not the literal truth – objects do not literally possess absolute momentum or speed, but only that which is defined by the expansionary geometry of the moment. This was seen earlier in the gravitationally unexplainable change from a parabolic plummet toward the ground, to a circular orbit about the planet simply because the geometry changed to one that continually overcame the Earth’s expansion once it passed a certain threshold in speed. Similarly, the Slingshot Effect changes the geometry from that of a slowing escape from the accelerating expansion of the Earth’s orbital ring, to an accelerating partial orbit about Mars, which then immediately becomes a rapidly rising orbit about Mars’ orbital ring on the way to Jupiter. Without the understanding that the dynamics in the solar system are purely due to changes in relative geometry as everything expands, we are left with today’s unexplained boosts in the absolute speed of spacecraft by a scientifically impossible gravitational force as they pass planets. The discussions throughout this chapter have shown that the current gravitational explanations of celestial events in our science today may serve as useful models, but cannot be the literal description of our observations. 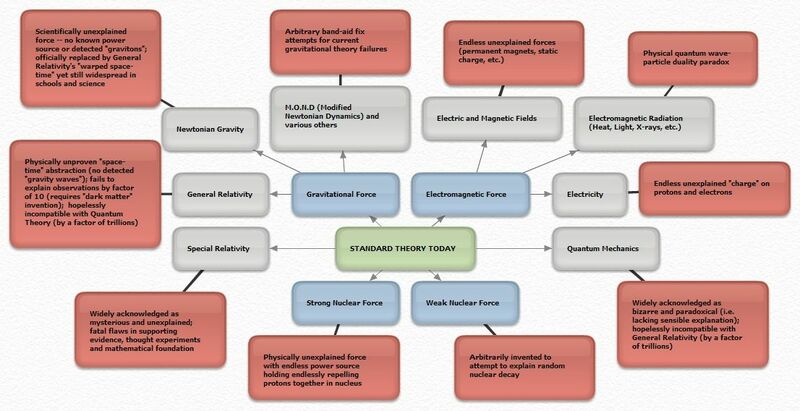 Therefore, since these models do not truly describe the underlying physics, it might be expected that difficulties and inconsistencies would arise that do not fit within these models. The inability of science to provide a viable explanation for the Slingshot Effect is one such example, though this has been hidden behind flawed logical justifications; however, one example recognized as a clear mystery is the anomalous behavior of spacecraft crossing our solar system. The complexities and course corrections involved in traveling among moons and planets tend to mask subtle anomalies that may exist in the behavior of spacecraft compared to standard gravitational theory. Recently though, NASA has noted unexplained course anomalies in five spacecraft passing Earth (Cassini, Galileo, Near Shoemaker, Rosetta and Messenger spacecraft). We have also had a unique opportunity to see such effects much more clearly since the Pioneer 10 and 11 spacecraft sped past Pluto and left the solar system well over a decade ago. Since there are no longer any moons or planets for the Pioneer spacecraft to encounter, any anomalies that may exist in their motions since leaving the solar system would stand out clearly and consistently over time. And indeed NASA scientists have noted and widely published observations of an unexplained additional pull on both Pioneer spacecraft back toward the Sun, exceeding the expected pull of gravity at that distance. This effect has been consistently recorded ever since the spacecraft left the solar system, having a constant unexplained decelerating effect on the spacecraft. Attempts to explain this effect using all known or proposed theories have so far been unsuccessful. However, when we look at this mystery from the perspective of Expansion Theory, these spacecraft journeys take on a very different quality. The situation now changes from that of spacecraft being pulled back by an unexplained additional attracting force, to that of an expanding solar system and the effect it has on spacecraft motion and the signals they send back to us. In many fixed-distance situations our determination of speed and distance already has atomic expansion built-in, being defined within the context of our planet and solar system where expansion underlies the apparently fixed reference points all around us. It appears as if reference points on the ground, or the orbits of moons and planets, are fixed distances apart, when they are actually expanding apart but appear unchanging as everything else also expands equally. So, signal blips arriving here from a transmitter sitting on Pluto, for example, are considered to indicate a fixed orbital distance, even though the entire solar system, including Pluto’s orbital ring, is expanding outward. But spacecraft that are not tied to this essentially fixed dynamic – those not in stable orbits about the Sun but which freely roam the solar system and beyond – often exhibit “anomalies” since their motion is open to the geometry of the underlying expansion dynamics, which we currently do not recognize. So as spacecraft head out well beyond Pluto the geometry of their motion becomes less like a distant planetary orbit, for which we now have well-refined models, and more like motion away from an expanding solar system, for which we do not. Also, as discussed earlier, today’s models of orbital mechanics do not actually use Newton or Einstein’s gravitational theories (though they are commonly thought to), so we do not normally put these theories to direct test on missions. The behavior of spacecraft departing the vicinity of one planet or arriving at the next during such missions would proceed roughly as planned and expected, since our refined models and techniques would apply to most orbit departure and approach scenarios. Deviations in between are not uncommon and have been noted, but the complexities of maneuvering between various moons and planets, combined with expected minor course corrections along the way, typically mask either the existence or meaning of such anomalies. But once the Pioneer spacecraft left the solar system, coasting smoothly away, consistent deviations from our models and theories became apparent. So then, as our spacecraft fly freely beyond Pluto, our solar system advances toward them, reducing the travel time of their signals heading back to Pluto. But since this effect is due to the size and expansion of our overall solar system while today’s space missions use the mass of the Sun and its gravitational pull on our spacecraft, discrepancies emerge from missions in such untested territory beyond Pluto. Although the rest of the signal’s journey follows our usual models and expectations between Pluto and Earth, the initial discrepancy in the expected travel time from the spaceship to Pluto means the overall travel time to Earth differs from expectations (Fig. 3-26). This is the likely cause of discrepancies reported for spacecraft traveling beyond Pluto, represented as an “anomalous and mysterious additional pulling force toward the Sun” in today's scientific language. This underlying expansion-based effect, which necessarily differs from today’s gravitational overlay that has been erroneously superimposed on observations, is the likely answer to the currently unexplained “Pioneer Anomaly” noted by NASA. Please use horizontal scroll bar if you do not see entire images.